Sweet, loving kisses. 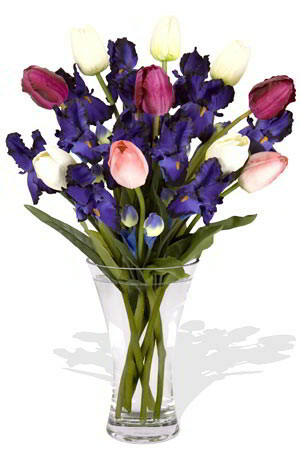 Send this bouquet of Tulips and Iris and show just how much you appreciate their constant support.Vase not included however; if you would like to leave a lasting impression we recommend a Premium Vase to perfectly complement your flowers. Nice floral arrangement that arrived in good time. Easy to order, prompt delivery and lovely flowers. What more could I ask! Thank you. I am satisfied with the service. Will recommend to my friends. My daughter was very overwhelmed and the boutique was just beautiful. Great stuff and I will be back! Flowers were lovely. Thanks very much. Daughter lives QLD, had operation. Lovely bright fresh flowers del pronto. This is 2nd time I have used zFlowers.com & pleased both times. Thanks Dulcie. I purposefully wanted the flowers to be delivered to her work as apparently it makes all the difference (compared to just giving her flowers at home). This worked perfectly and she was very happy and grateful. The website was easy to use and the flowers arrived as requested. Your website is easy to navigate and the staff member whom I spoke with on the telephone was very friendly and helpful.